Fun With Frisian: Everyone Likes Elk! 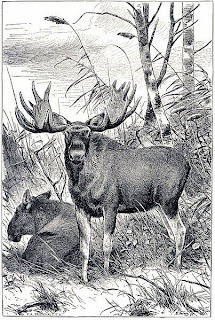 If you have come across this blog by accident, you might still leave this site with at least one bit of modern West Frisian forever stuck in your head: elk, which is said like the English word for the large grazing animal, means "everyone" or "every." You will also find the word elts in use. It is pronounced with the "eh" in "elk" and means the same thing. Elk hat rjocht om dingen yn eigendom te hawwen. Everyone has the right to have property. Hat means "he, she, or it has." It is said with a long "ah" as in "father." HAHt. At the end of the sample sentence is the plural form of the same verb, hawwe, meaning "they have." This word takes a long "ah" as in "father" and a schwa on the end. HAH-vuh. We have seen the word rjocht (old spelling rjucht) before in several posts. This word means “right," "straight," "law," or "direct." Say it with a long "oh" as in "road." RYOHcht. Om was the subject of the very first lesson. It means "round," "for," or "at" and rhymes with the English word "roam." OHm. Ding is the plural of ding, and has the same meaning as its English cognate, "thing." Say it like the English word, but with an initial d- instead of a th-, as in the sound of a bell being struck. DIHNG. The plural takes a schwa sound. DIHNG-uhn. Yn means "in" and is said with a long "ee" so that it rhymes with "green." EEN. Eigen is an adjective meaning "own." The -dom ending in West Frisian has an equivalent function its English twin, e.g., hartoch (a duke) and hartochdom (dukedom); frij (free) and frijdom (freedom). As a quick pint of interest, I'll note that frij is pronounced with the -igh sound in "might" or "eye." Likewise, eigen begins with an "igh" vowel and takes a schwa in the second syllable. Dom is said with a long "oh" as in the English word "dome." IGH-guhn-DOHm. Te means "to," "at," or "in" and may be said with a schwa. Elts hat rjocht op in iepenbier proses. Everyone has the right to public process. I'll finish by noting that iepenbier is related to the word iepen, meaning "open." Say it with an initial long "ee" as in "week," followed by a schwa. The middle part of the word takes a schwa. The final part of the word repeats the "ee" followed by a schwa combination. EE-uh-puhn-bee-uhr.